In 2015, we’ll be publishing our ministry magazine, Happy Endings, every other month. On the off months, I’m going to send you a letter (like I’m doing this month). The reason? 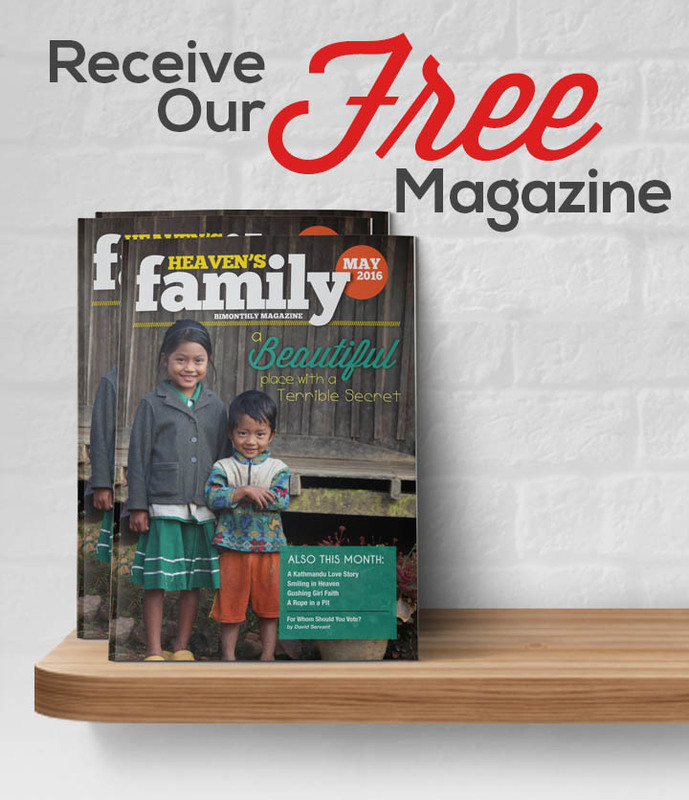 My letters have proven to be more effective than our magazines at motivating people to make sacrifices on behalf of the “least of these.” Since the entire reason that Heaven’s Familyexists is to serve suffering members of our spiritual family, it only makes sense that we do what serves them best. So this is a no-brainer. With our new publishing schedule, we hope to have found the perfect balance between sharing fulfilled needs (in our bi-monthly magazines) and unfulfilled needs (in my bi-monthly letters). We’re launching something we’re calling the Compassion Club. The concept is simple. Compassion Club members make a commitment to invest—according to their means—on a monthly basis. And every month, I’ll personally select worthy projects to fund with those investments, projects that span the spectrum of all that Heaven’s Family is doing to care for the poor and build God’s kingdom around the world through our 21 Focused Funds. Over the course of a year, Compassion Club members will likely be caring for orphans and widows, serving victims of wars and natural disasters, helping bring the gospel to prisoners and unreached people, preventing the trafficking of children, and much, much more. Every month I’ll report to Compassion Club members to inform them of how their investments have been used and what they are accomplishing. I also intend to share some behind-the-scenes stories in my emails that will help members better understand the inner workings—including the challenges—of Heaven’s Family. This one is up to you. I’m asking you to look at your giving in perhaps a different way than you ever have before. It is sometimes said that “time is money,” and it is certainly true that the two are directly related, as everyone who earns an income must first invest time. In one sense, when you give to help the “least of these” (as Jesus expects of all His true followers…see Matthew 24:31-46), what you are really giving is your time—the time that it takes to earn the money you give. If you earn $10 an hour and give $10, you’ve given an hour of your time for the sake of God’s kingdom, just as much as a missionary or evangelist gives his or her time for the sake of God’s kingdom when preaching or teaching. That hour at your “secular” job is just as sacred as any hour of any missionary’s day. Of course, we know that love, void of sacrifice, is not love at all. You can give without loving, but you can’t love without giving. And if loving the “least of these” is the ultimate litmus test of one’s love for Jesus (as Jesus taught), we can only conclude that every true follower of Jesus ought to sacrifice as much time as possible serving them. For this reason, I’d like to encourage you to consider committing four hours each month towards serving the “least of these.” That way, you can rejoice knowing that you are working one full hour every week purely for the Lord’s glory…loving Him through loving His suffering saints. If you’ve already reached or surpassed that goal (as many of you have), then I encourage you to aspire to grow in your love, which—of course—requires greater self-denial. There can be no more worthy goal. And so I unashamedly ask you, will you become a charter member of Heaven’s Family’sCompassion Club? This month, together, with our collective investments (I’m also a member), we’re going to spend some of our time visiting Jesus in prison, something He told us we should do. Everything that is received through the end of April will be invested in our Prison Ministry & Rehab Fund (next month I’ll tell you more specifics). And every one of your future monthly investments will similarly help meet pressing needs of the “least of these” and build God’s kingdom. To join the Compassion Club, call toll free 1-855-333-2211 or visit HeavensFamily.org/cc. You will be glad you did—I guarantee it! On behalf of all who will benefit from your compassion, thank you!